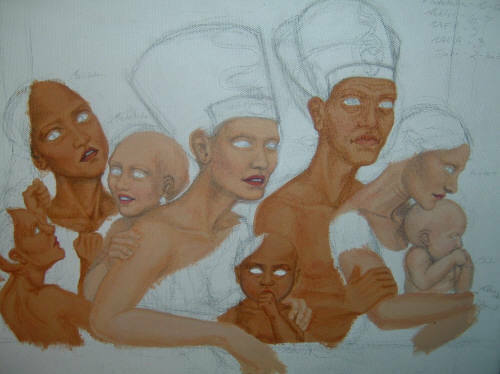 "Amarna Family Portrait (in progress)"
This page is image heavy by necessity and may take some time to load. Thank you for your patience! When asked about my creative process, I usually answer honestly (albeit evasively), "It depends on the painting." 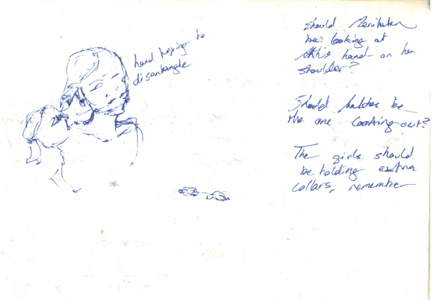 Some ideas wake me at the witching hour and are ready to be transferred to canvas immediately; others require sketches, research, and (when at all possible) museum visits. I've chosen one of the latter, more demanding paintings to illustrate my methods. Since this is also a commission, this web page will have the added benefit of letting my client see her request come to life! Sketching a painting out can take anywhere from a few hours to a few nights, depending on how quickly I can get the lines to match what I see in my mind or whether the idea becomes into something else entirely. 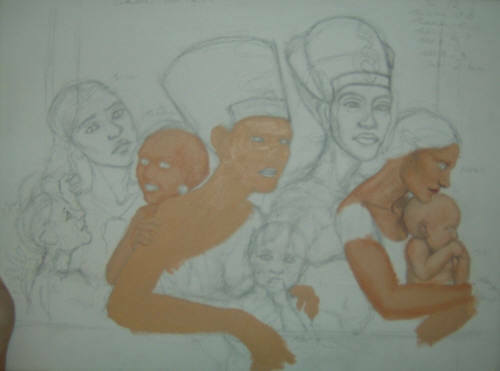 In the case of "Amarna Family Portrait," drawing was spread over several nights owing to my constantly referencing the history books at my side. Rarely, I'll also scribble notes onto my paintings. 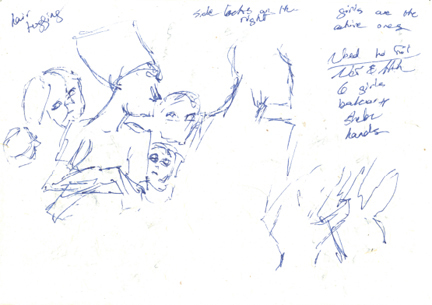 The illegible mess in the upper right-hand corner are notes concerning the ages of Akhenaten and Nefertiti's six daughters in Regnal Year 14, which is the last year possible that the family was together. (Evidence suggests that Meketaten died in childbirth that year, and Sotepenre also disappears around same time--but the nerd in my digresses. I'll cite my sources below). My first sketches/doodles are never much to look at! Each painting starts out in its own way. 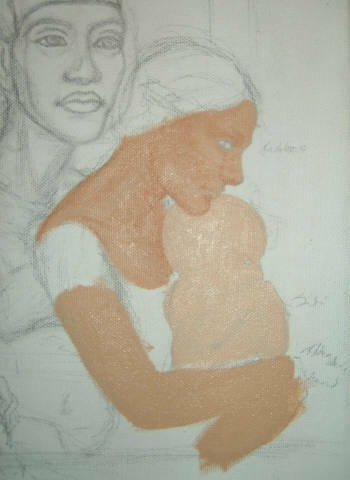 If the background requires a sky effect with a great deal of blending, then I will fill it in before any figures. This lessens the risk of accidentally painting over something and results in a smoother finish (i.e. an obvious halo from me circling existing figures). With the exception of backgrounds and some clothing, which I will blend wet, I work almost exclusively in layers. I put down a basic skin tone, then overlay the shading and highlights. For this reason, I prefer fast drying paints like acrylics and watercolor, though in my impatience, I've been known to use a hand-size fan to speed the process even further. My people tend to stay bald for quite some time to insure that, when they are finally blessed with hair, there aren't blank spots showing through where background or skin should be visible. My boyfriend teases that I'm forever painting balding zombies, as I also leave the eyes for the very last. I do believe that eyes are the windows to the soul, and I need to experience the rest of the painting and all the thoughts that go with it before I feel ready to add the final touch--and spirit--to the subject's face. Pardon the dim digital photos, but I'm not my most focused at the end of a long night. This canvas was unfortunately too large for my scanner, and I couldn't well haul "Amarna" to work everyday to use the large-format scanner there. (The less risk to the piece, the better). When doing a portrait, I rely on what I know about the person(s) in question to guide the way. The famous bust of Nefertiti in Berlin shows her with a necklace, but at least one relief and a statue fragment show her with an off-the shoulder garment that I thought more flattering given her long neck and posture. Equally meticulous are the signs of her age. 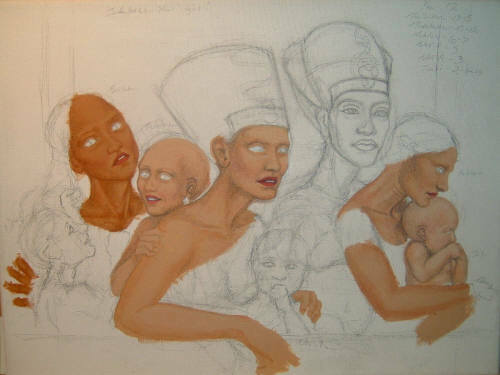 I wanted to remind the viewer that Nefertiti had had been a queen for half her life and had born six living daughters, maybe more (stillbirths or infant deaths were rarely recorded in Ancient Egypt). 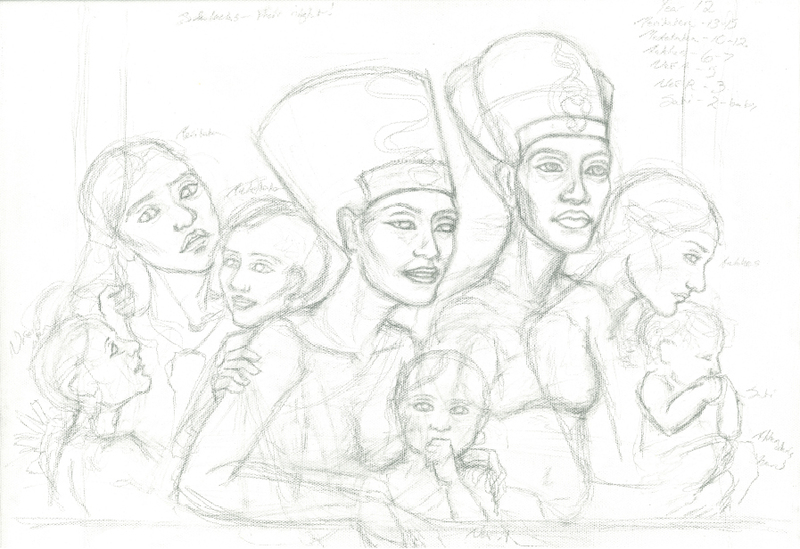 As for said daughters, they are, from left to right: Neferneferuaten (fourth born), an understandably distressed Meritaten (first born), a dimpled Meketaten (second), Neferneferure (fifth), Ankhesenapaaten (third, and future wife of King Tutankhamun), and baby Sotepenre (sixth). Ankhes has always been my favorite of the girls, so she tends to have the most attention lavished on her. Akhenaten, while not handsome, had features--a sensual mouth, heavily lidded eyes, high cheekbones--that should have made him so, and for this reason I find his expression especially compelling. His countenance plays nicely against the softer, more streamlined faces of his wife and daughters, who overlap in the painting much as they do in the ancient reliefs. The princesses are often portrayed playing, while their parents are shown kissing and embracing. In one relief, Nefertiti even sits in the Akhenaten's lap, with at least two daughters gathered into hers. Whatever the family member's individual fates, they seemed to be genuinely close-knit during the limited time they were together. Arguably the most enjoyable aspect of this painting was the excuse to delve into my much beloved Egyptian library. When I say that half of my money is on my bookshelves, the other half hanging on my walls, I'm not kidding! I've restricted this list to only those volumes which were constantly at my side whilst painting, as opposed to ALL of my books, which were flipped through in turn. Aldred, Cyril. Akhenaten: King of Egypt. London: Thames & Hudson Ltd., 1988. 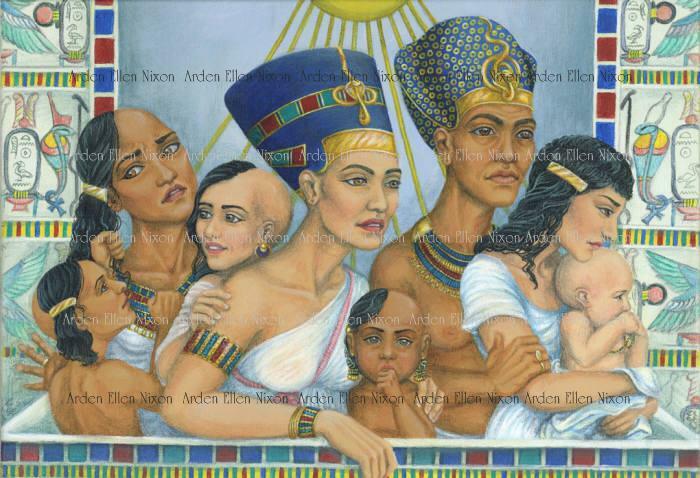 --Akhenaten and Nefertiti. New York: Viking Press, Inc., 1973. --Jewels of the Pharaohs. London: Thames & Hudson Ltd, 1971. Andrews, Carol. Amulets of Ancient Egypt. Austin: University of Texas Press, 1998. Arnold, Dorethea. The Royal Women of Amarna: Images of Beauty from Ancient Egypt. New York: Metropolitan Museum of Art, 1996. Redford, Donald B. Akhenaten: The Heretic King. Princeton: Princeton University Press, 1984. Reeves, Nicholas. 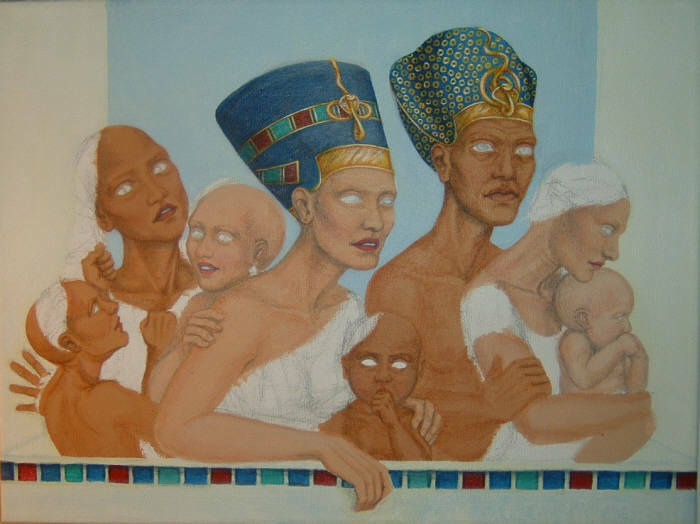 Akhenaten: Egypt's false Prophet. London: Thames & Hudson Ltd, 2001. Tyldesley, Joyce. Nefertiti: Egypt's Sun Queen. New York: Penguin Putnam Inc., 1999. Pharaohs of the Sun: Akhenaten, Nefertiti, Tutankhamun. Boston: Museum of Fine Arts, 1999. 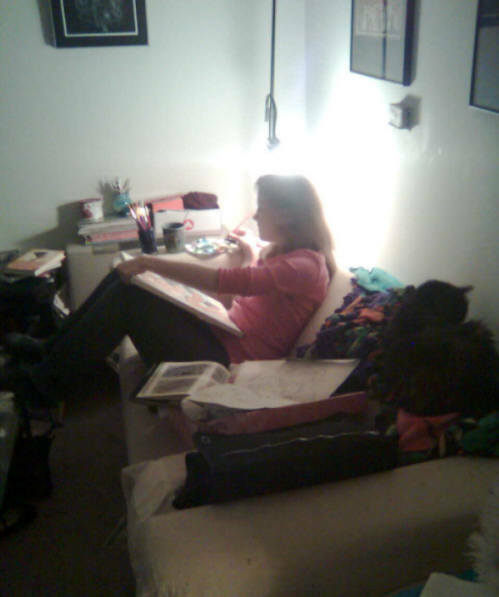 My Nicholas snuck this picture of me back in January 2009 when I was working on "Amarna Family Portrait," thereby capturing a true portrait of me: reference books on every side, the glorified boot box that is my art case, and at least one cat waiting to drink from my paint water when I'm not on guard.